Tapsee Pannu is one among the busy actress who stars in Bollywood, Tollywood and Kollywood films. The ‘Chashme Baddoor’ actress who recently bagged a super hit with ‘Ganga’ (Kanchana 2 in Tamil) has landed herself in an ad promotion of hair oil. 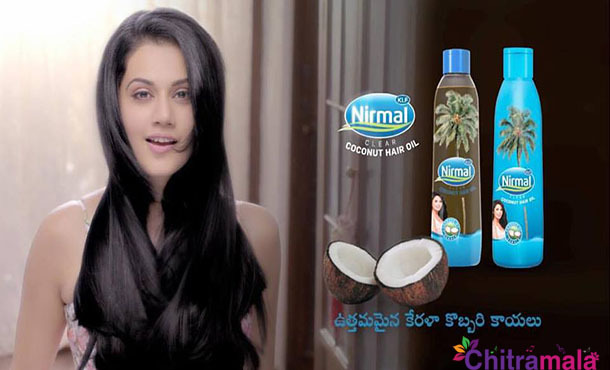 The 28-year-old Delhi girl will promote ‘Nirmal Coconut Hair Oil’ and is happy about that. Tapsee has a reason behind this happiness; she will be promoting the Nirmal hair oil, and Tapsee’s mother name also happens to be Nirmaljeet Pannu. It isn’t any surprise for her when a hair oil brand comes to her, as she was known for her curly, beautiful hair since her college time, Tapsee says. Tapsee further said that quality and standards are her prior check when endorsing a brand. In the past too she said that she rejected offers from popular hair oil companies only because of low standards. Brands that value her and the users are the only ones that she opts, says Tapsee.